Sakai Guides and DocumentationSakai Complete User Guide Tests and QuizzesHow do I create an assessment in Tests and Quizzes? The Tests & Quizzes tool allows you to create online assessments (i.e., tests, quizzes, exams, and surveys) for your students or other groups. It was designed primarily to administer tests, but you may also create assessments to gather survey information or informal course feedback. 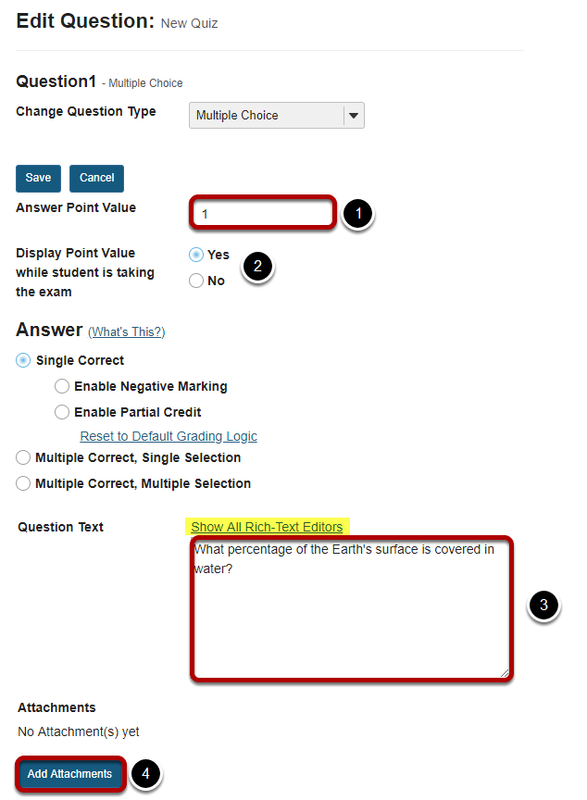 Grading for most question types is done automatically, and grades can be posted automatically to an online gradebook. This lesson will show you how to create a simple assessment and add a single question. Zoom: Create a new assessment. Give your new assessment a title and click the Create button. The "Create using assessment builder" option (shown selected) asks you to write questions one by one, with a simple example given below. For the other methods of creating an assessment, see How do I create an assessment from markup text or cut and paste? and How do I import questions into a new assessment or question pool? Note: You cannot have more than one assessment with the same title. 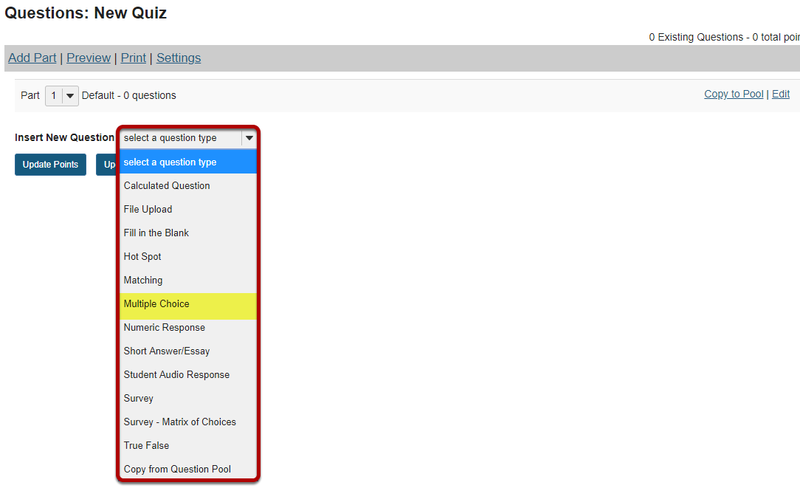 Select the type of question you would like to add from the Insert New Question drop-down menu. Let's add one of the more common question types. Select Multiple Choice from the drop-down menu. Set the general question options. 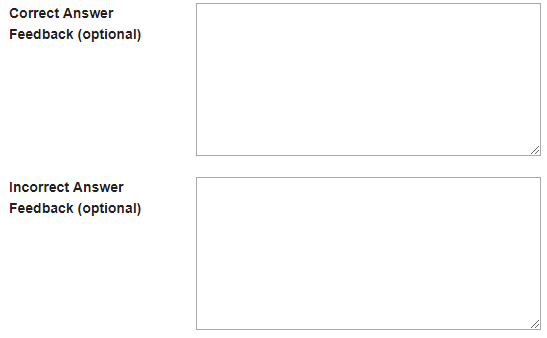 For these general parameters, see How do I add a new question (with the assessment builder)? Other options regarding the answer and configuration are specific to the question type. Note: The Rich Text Editor is available for use in composing your questions and answers. Click on the Show All Rich Text Editors link to display the editor. Choose number of correct responses (for multiple choice). You can choose to have a Single Correct response, Multiple Correct, Single Selection, or Multiple Correct, Multiple Selection. 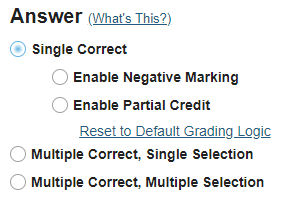 If you select Single Correct (the default) you also have the option to Enable Negative Marking or Enable Partial Credit if desired. Negative marking deducts points from the student's score if the student selects the wrong answer. Partial credit allows you to specify a percentage of the question points to be awarded for selecting an incorrect but still partially acceptable answer. Choose the radio button for the correct response option you would like to use. For this example, we will keep the default. Enter the answer choices (for multiple choice). There are four answer choices provided by default. If you need more choices, use the Insert Additional Answers drop-down menu to indicate the number of additional answer choices needed. Be sure to indicate the correct answer by selecting the radio button for the correct response. Choose whether or not to randomize answers (for multiple choice). The default setting is No for randomizing answers. 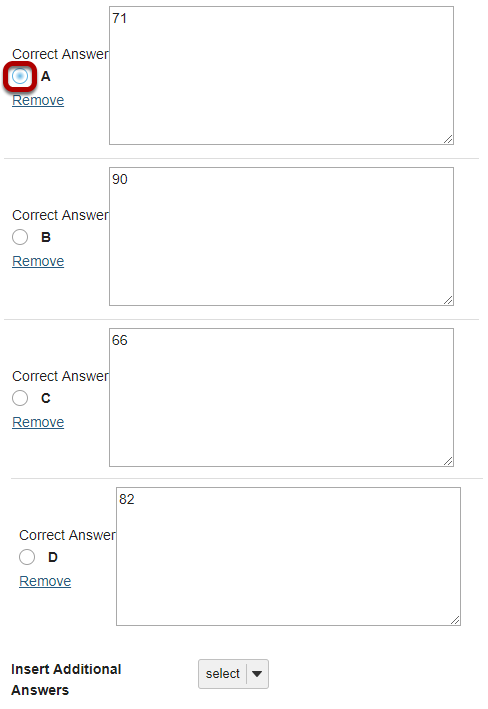 If you would like the answer choices to appear in a random order each time a student takes the assessment, select Yes. Tip: Remember that if you answer choices contain items like "all of the above" or "A and B are correct" randomizing the order could cause confusion with the answer key. Choose whether or not to require rationale. The default setting is No for requiring rationale. If you want students to write an explanation for why they chose a particular response, select Yes. If you would like to provide feedback for students based on if they answer the question correctly or incorrectly, enter your feedback here. 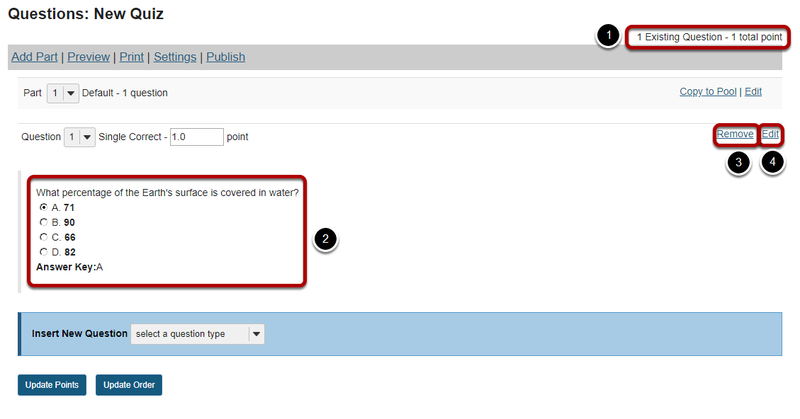 Once you have entered all of your question information, click Save to return to the edit assessment screen. The total number of questions in the assessment, as well as the total points will be displayed in the upper right corner of the content area. You may view your questions the assessment editing screen, along with the answer key shown below each question. If you would like to delete a question, click the Remove link to the right of the question. If you need to make a change to an existing question, click the Edit link to the right of the question. Tip: An assessment must have at least one question, and the question must be worth greater than zero in order to add the assessment to the Gradebook. Prev: What is the Tests & Quizzes tool? Next: How do I create a new assessment using markup text or cut and paste?